Spring is officially here. But where I live, in the great Pacific Northwest, it's just another gray gloomy day with alternating periods of downpour interspersed with teasing glimpses of the sun. 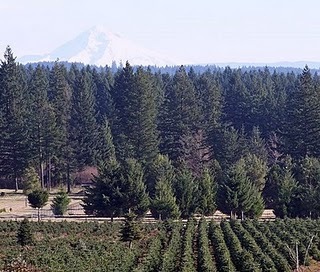 View of our farm with Christmas trees in the foreground. This is the view, from our bedroom window, that we wake up to each morning. Douglas fir trees as far as the eye can see and majestic Mt. Hood (on a clear day) peeps out over distant tree tops. 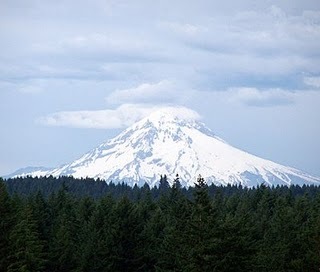 Lately, though the mountain is nowhere to be seen, so I'm posting these pictures to remind me and to share with you, how beautiful Mt Hood is. I'm hoping too that soon the clouds will lift and the mountain will once again adorn our view with it's natural beauty.